Here’s an exercise in humility you can repeat as often as needed: learn something new in front of your children. What better way to teach them perseverance, a teachable spirit, poise in the face of frustration, and ‘everyone’s a dummy at something’? This method works with any skill at which you are a rank beginner. It has the delightful side effect of encouraging your children to make great strides in the area you choose, in a healthy effort to outpace you. They may be intimidated by an older brother’s prowess, or too snobbish to compete with a younger one, but you are a worthy competitor when you must start at their level. 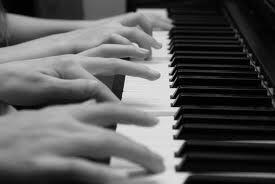 For example, I have, over the years, begun to learn to play the piano several times. Now and then, there is a window of opportunity between nursing and diapering, between toilet training and phonics. I have seized the day – whipping out the old piano primer (I believe in beginning at the beginning every time since it is sometimes years between attempts) and sitting down to move through it diligently. My confidence soars as I move with experienced aplomb through Ode to Joy, to Lightly Row and on to Go Tell Aunt Rhody before the first interruption. Children resettled for a time, I return to the more challenging Merrily We Roll Along. This exercise gives me greater sympathy with the uncoordinated bumbling of my little ones – a feeling of kinship with all those for whom life is a struggle. Suddenly I know what it is to be learning disabled, in a personal way. I relate to St. Peter – so quick to know the right way, so clumsy in doing it. The tedium begins to tire me. I see why it frustrates my kids to hear a chipper, “Just have a good attitude!” when nothing is going right. My piano orphans are nearing the ends of their ropes. Pressure is building. Those who have been through this with me before enjoy the suspense. Will she, or will she not hit the wall? Failing, once again to reach my goals, I receive the genuine sympathy of my children. They now count me among those who truly understand their own inexplicable incompetencies. I hope to inspire in them a nobility of character, refusing to put myself down, or to give up without a fight, accepting this setback cheerfully and looking with hope toward a brighter future. At any rate, I do aspire, and hope my children will someday see me move onward and upward in piano playing and in the sanctity it helps me to develop. Note: This article first appeared in Canticle when guys who are now six feet tall were the piano-banging toddlers. I’m now waiting until the nest is empty to begin again, and hoping to set a good example for my grandchildren, or get holy trying!